Frances Huynh is constantly looking for ways to grow and learn. From San Gabriel Valley, she is currently a MPH (Community Health Sciences)-MA (Asian American Studies) candidate at UCLA. Her passions in social justice, community building, and public health include improving the quality of health(care) for low-income communities of color, advocating patient-centered care and preventive care, building healthy communities through challenging gentrification and the lack of affordable housing, and conscious/ethical consumerism (food and clothes) in relation to sustainability, labor, and health. She loves mac n' cheese, Frank Ocean, and stories. Her gratefulness for her family, history, and community to be where she is today and where she will be in the future is the constant driving force in everything that she does. When I first saw Frances’ name arrive in my email inbox, I thought I had accidentally copied myself in an email (my name is Francesca Huynh). I’m happy to report that I didn’t. Frances Huynh, who reached out to me with an interest to be interviewed, was working at a cultural resource center called Asian Pacific Student Programs at the University of California, Riverside, when we got in touch in the Spring of 2014. The first time I met Frances Huynh, I was dropped off a block away from Arroyo High School in El Monte, a city in Greater Los Angeles by San Gabriel Valley, feeling like a kid on a movie set. I didn’t feel like a stranger for long though—almost immediately, I spot Frances speed-walking along the sidewalk towards me (I think I lost my cover by carrying a binder around in mid-July by a high school) with an enthusiastic, warm smile. “It’s so nice to meet you!” I semi-shouted. Frances welcomed me with a light hug. She was bright-eyed, youthful, and optimistic—the kind of person who cultivates safe spaces people need the most. Of course, that’s what she was great at doing. Frances was an on-campus do-er who spent her undergraduate career spearheading campus-wide dialogues and collaborating with other resource centers and organizations to diversify and improve student life. Currently, she coordinates outreach efforts at the Chinatown Community for Equitable Development to advocate and educate low-income and immigrant communities on tenant’s rights and social services. Her LinkedIn profile boosts multiple Activism Awards and a Graduate Opportunity Fellowship at UCLA, where she will be attending this fall to further her commitment to Community Health Sciences. Her “growing list of passions” include: analyzing the efficacy of the (Los Angeles) health care system, policies, and programs and developing practical programs for low-income, communities of color throughout the county, among others. I had the pleasure of meeting Frances in her hometown on a beautiful, blue-sky July afternoon. During her interview, Frances discussed her studies, why high school was a meaningful place, and how the “626 bubble” heavily influenced the way she understood her racial and ethnic identity. 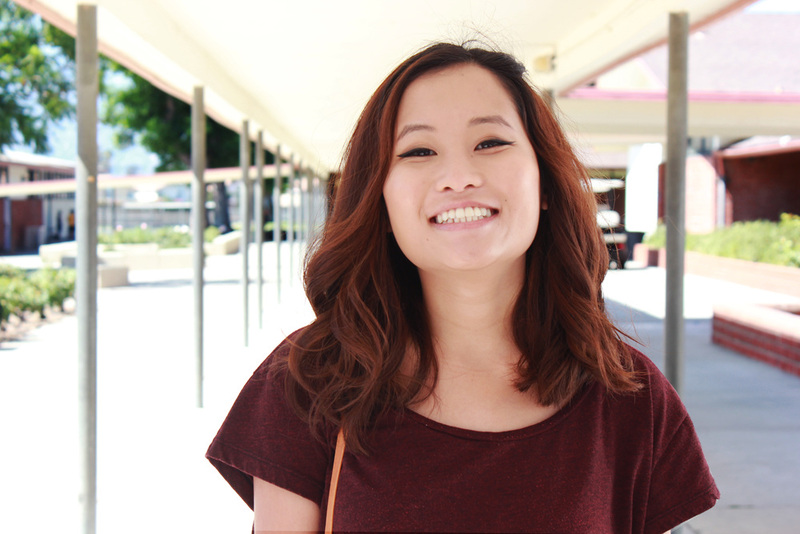 Francesca (Q): Today’s Thursday, July 17, 2014 and I’m at Arroyo High School in El Monte, California with Frances Huynh. Could you tell me a little bit about yourself and your background? Frances: I’m from El Monte, California. I’m almost twenty-two years old, turning twenty-two next Tuesday. I’m Chiuchow—that’s my ethnic identity. Chiuchow is the language itself too, so I speak Chiuchow at home fluently. It’s a Chinese dialect but we don’t exactly have our own country to go back to. My parents are from Vietnam but they consider themselves Chinese. I have three brothers. I’m the second youngest in my family. I just graduated from [University of California at] Riverside with global studies. I was very active in my cultural resource center back at school, Asian Pacific Student Programs. We have a really big API (Asian/Pacific Islander) population at school, probably out of the [University of California]’s, it’s top three with [University of California Los Angeles] and [University of California Irvine] for API population. It’s around forty percent. I was really active, engaged in my community back at school. I want to go to grad school in the future. I want to go into public health, but hopefully I can find a program that’s also in Asian American studies because ultimately I want to work in the community—specifically the API community. Q: Today I asked you to bring me to a place that’s significant to you and your personal history and you chose the high school you went to. Could you tell me a little bit about why you chose this place to meet today? Frances: I had a really hard time trying to figure out one specific place that really stood out to me because I feel like basically the whole San Gabriel Valley is really meaningful for me. I chose high school because I feel like high school for everyone is a turning point. I self-reflect a lot and I’m a really thoughtful person. In high school I felt like that’s where I was beginning to figure out my identity but it wasn’t until college where I really had a strong sense of who I was. It’s very reminiscent to be back here and I feel like I met my closest friends here. I found my support network here. This high school just reminds me of everything I grew up with and that’s why I chose it. Q: How do you think your upbringing here has really shaped your understanding of your identity at that time? You said that changed when you went to college right? Frances: It definitely made me more outgoing. I know I seem shy right now because I kind of am shy. Freshman year of high school when I started here, I was really shy. Super quiet. Not confident at all. That’s when I decided, I’m going to join every outgoing thing you could think of in high school. So I joined drama for four years and A Student Body (ASB). In ASB, I was the commissioner of activities so I was the person at lunch holding the mic trying to get people to play games and stuff. I feel like over the years, being at the school really changed me. I started believing in myself more. I found friends that are my best friends today. I feel like everything here helped transition me into college better. Q: Could you tell me more about the neighborhood you grew up in? You said you lived in El Monte your whole life right? Frances: El Monte is predominately Latina, but over the years it has becoming more API and more diverse. I feel like that really affected my own sense of identity when I grew up because even though I surrounded myself with all the Asian kids and my group and this diverse environment, at the same time I didn’t know much about other people and other backgrounds outside of my own. I just stuck into my own bubble. And anyone in the 626, you can ask them—there's this "Asian bubble" living here. We take advantage of what we have—this comfort zone that we have. And so, even though it's really diverse here, I never realized that until I left to college. Growing up in El Monte, it made me realize so much about myself because I grew up in a low-income family, working-class. My parents have been working their entire life. When people think about El Monte, they don’t think of the fanciest city out there, they’re like – when I’m back at school – “Oh where are you from?” I’m like, the 626. They’d be like, “Where?” Oh, um, Arcadia. Automatically they think if you’re from Arcadia, you’re supposedly rich. But I’d be like, I’m the city next to Arcadia. They don’t understand that there’s such a disparity between the cities even though they’re right next to each other. Q: Do you feel closely connected to El Monte even after leaving for four years? Frances: Yeah, because every time I do come home I still hang out with my high school friends. I have a lot of high school friends who still go to community college or stayed here over the years. I feel really close to El Monte still. Q: With this project, I chose to specifically look more at the ethnic Chinese Vietnamese American experience and you said that sometimes you would identify as that. Could you tell me how closely connected you feel to that identity? Frances: Honestly, growing up, I was so confused about who I was identity-wise. Every time we had to fill out forms and it’s Chinese or Vietnamese, I’d just be like, oh today I feel Chinese. So I’d fill out Chinese. On other days, I’d be Vietnamese. And towards maybe middle school or high school, I realized, I'm Chinese and Vietnamese. That's a thing. I can be both. I remember since I went to college and talking to my parents more about identity and having those conversations, my mom made it really clear that we were Chinese and not so much Vietnamese even though she and my dad grew up there entirely. Both sides of the family grew up in Vietnam. She identified as Chinese, specifically Chiuchow. So as of right now, I would say I’m Chiuchow first, but at the same time I would say Chinese Vietnamese because I want to acknowledge geographically that my parents grew up Vietnamese but ethnically they’re Chinese. I want to touch base on all parts of my identity. Students outside of Arroyo High School in El Monte, CA. Q: Do you feel that both Chinese and Vietnamese culture appears in your day-to-day life? Do you feel like you are more closely connected to one part of your identity? Frances: I feel it’s hard to differentiate between them once you think about the daily—like culture and being at home. I feel like growing up, I didn’t really know the difference because both cultures were integrated. I have a lot of friends that are Chinese and Vietnamese. And after talking to them all throughout these years, I feel like I can identify with both cultures. It’s hard to pick between the two. For my parents, they speak three different languages at home. With me and my brothers, they speak Chiuchow and sometimes English. But then I’ve noticed recently when they speak to each other it’s in Cantonese. I don’t know why – maybe they’re more comfortable with that language or because they thought we didn’t understand what they were saying this entire time but we kind of know what they’re saying. Sometimes they do throw in some Vietnamese. I’m just like, how do you do that—just switch off from languages all the time? I remember, last year actually, my mom was telling me and my little brother a story about growing up in Vietnam. She said that in her household she used to hang out with a lot of the Vietnamese kids when she was little and they would speak in Vietnamese. At home in Vietnam, she would speak Chiuchow. And she said one time, they were in front of the house and the kids and her were speaking Vietnamese. And then her grandma, who was all the way in the back of the house, heard her speak in Vietnamese. And she went towards the front and she grabbed my mom, and she's like, "What are you doing? You're not Vietnamese! Don't speak Vietnamese! You're Chiuchow!" After she told me about that story, I’m just like, oh wow. It really shows you that contrast between the cultures and that ethnic pride. Q: Could you tell me a little bit about your parents’ ancestral background and they decided to come to America and where did they grow up in Vietnam? Frances: I’m not really good with specific details. I know my parents have told me a million times, but it’s so hard to remember. I know they grew up in Vietnam in the rural side and they came here in the 1980’s. So a couple years after the Fall of Saigon and everything. On my mom’s side of the family, she has a family of four siblings. She’s the oldest of the entire family. For my dad’s side of the family, there’s nine siblings. For both sides of the family – they didn’t know each other in Vietnam – when they left and went to the refugee camps in Malaysia, they were the first ones from their family to go. They had to go, get money, and bring the entire family with them. I remember my mom would tell me about when they were in Malaysia. They kind of knew of each other, but they didn’t know each other that much. My mom swears that when she was young she was the prettiest girl of them all. Every guy had a crush on her. She swears that my dad had a crush on her in Malaysia, even though they didn’t really know each other. My dad always volunteered to cook for the camp, so he would always have to walk through where my mom was staying in the refugee camp. They would always see each other and say hi every so often. And then, I know from my mom that she was with her little brother when they were in Malaysia. They tried getting sponsorships to Australia because her grandma – my great grandmother – got sponsored for Australia. That side of the family went there. But then Australia didn’t want them, so my mom and her little brother got sponsored to come to the U.S., so they came to California. And I know from my dad that he was with the second oldest son of the family. They got sponsored to the U.S. too and they first went to Florida and somehow they found their way to California. I don’t know how – that’s really far. Then my mom told me how she and my dad got connected again. It's so cute. They were both living in the 626. And one day, he was at the supermarket in Monterey Park and he ran into my mom's cousin. So my dad eventually started hanging out at my mom’s place with the entire family. My mom told me he was really persistent. He obviously liked her, so he would constantly call her and ask her out on dates. Eventually she gave in and she’s like, “I’ll go out with you.” They started dating and now they’ve been married for thirty years. Q: I feel like those stories are really common for people who were also in those refugee camps for a little while. How long were your parents in that refugee camp? Frances: I’m not sure exactly. Probably a couple years. Q: Yeah. It’s usually one to four years for most people. There’s some form of informal network that has led everyone to a particular place and particular settlement patterns that take people to places where they somehow meet again somewhere. Frances: I know. Everyone ends up knowing each other from Vietnam or Malaysia. Frances: Yeah, I know my parents have run into so many people in the 626. They’re like, “Oh, your uncle from Vietnam, we used to be really close and neighbors…” It’s really crazy. Q: I do wonder sometimes about the ethnic Chinese Vietnamese that came to resettle here. Frances: Yeah, like why did they choose to live over here? I remember my dad saying that when he moved to El Monte in the very beginning, it was predominantly white. As you can see now, it’s more Latino and API. So it’s kind of interesting to think when that shift happened. Q: That’s very true for cities like Monterey Park that used to be white-dominated in the 80’s and now it’s 60% API or something like that. Mostly Chinese American. Do you happen to know why your parents chose to come to California? Frances: I think it was because they had family here. I’m pretty sure they – even though they were the first child from their individual families to come here – had cousins here already. I’m pretty sure that’s why. I don’t know how my dad got from Florida to California. Probably because he found out there were people from Vietnam coming here and he knew. I’m sure they really love living here. It’s just that they feel very comfortable. Everywhere they go they run into someone they know. Q: At least they have that chance to, especially in a place so far from their home country. I think it’s really interesting that the people that I’ve interviewed so far, who are from this area, have said that there’s a pretty significant population with similar background to you and I. That’s not something I’ve ever heard of where I’m from – having a large community with the same kind of background – on the East Coast. Do you see that a lot in El Monte? Frances: Yeah, definitely. I think more so in San Gabriel and not so much in El Monte. I know that in San Gabriel it’s more API than everywhere else. Frances Huynh in the courtyard of Arroyo High School in El Monte, CA. Q: You said before that you feel pretty closely connected to this city, even after leaving you still connected to El Monte. Do you feel close at all to your parents’ country – Vietnam –through the dialogue you have with your parents or the stories they’d tell you? Frances: It’s hard to explain. I feel this connection, but at the same time I only have that connection because my parents are from there. If I did go back to Vietnam, everything would feel familiar just because of the stories I hear from my parents. It’s not a direct connection for me personally. I’m living through my parents’ stories and that’s why I feel close to Vietnam in that way. Q: Do you want to go to Vietnam some time? Frances: Definitely. My dad’s been back a couple times since they immigrated to the U.S. For my mom, I don’t think she’s been back since she’s moved away for thirty years. She’s okay not going back. Hopefully, in the near future, we’ll get to go back. Q: How do your siblings think about the same situation and how it’d be like to go to Vietnam to see your parents’ country? Frances: Even if they do think it, we don’t talk about it. My siblings are not so much thinking about their identity all the time and trying to have these conversations like I am. I’m sure out of my three brothers, my second oldest brother would be the one that would want to go back to Vietnam more than the others. I can’t really speak for them. From what I can see, I feel they are okay just being here. That connection for them to the homeland is more distant than the connection is for me. Frances: For me, I feel that closer connection because I did go to Riverside and I was in these spaces where we’re constantly reflecting on where we came from, where our parents came from. Just thinking about all these concepts of ethnic and cultural identity. I feel like for my brothers, they haven’t been in these spaces so much, so they haven’t had to actively think about it. Maybe that has a factor on how connected they feel. Q: That makes sense. How old are your brothers? Frances: My oldest brother is almost 28. My second oldest brother is almost 24 and my youngest brother is almost 19. Q: If you did go back to Vietnam, how do you think that would be significant to how you choose to identify? Do you think it would change at all or strengthen the way you think about your identity? Frances: I feel like it would definitely strengthen my identity. Since I choose to identify as Chinese Vietnamese, I feel it would give that second half…not legitimacy but it would strengthen the whole reason why I would identify with Vietnamese. I want to acknowledge where my parents came from and where they grew up geographically. Going back to Vietnam would give me a better sense of why I choose to identify as Vietnamese. It's because of this place [that] my parents gained a sense of who they are. Q: I feel very similarly to that too. Sometimes I feel like I want to reconcile with a past that’s not really mine. Frances: I feel like a lot of people want to do that when they return to the homeland. Q: It’s so strange to say, “I want to go back,” when I haven’t actually been before. Like it’s something I have to do. Frances: I know that my dad loves Vietnam. He can go back whenever he wants and he’ll be okay with it. Not so much my mom. Maybe that’s because of the politics and family issues. Every time I bring it up with my mom – Oh let’s go back. Let’s go back. I want to visit where you all grew up. My mom would be like, “Why?” She’d really question why I’d want to go to Vietnam. It’s so hot there. She’d come up with reasons I shouldn’t go. Q: Would you say your father looks at Vietnam more fondly than your mother for the most part? Frances: I’d say so. Yeah. Also because he has more family there. Most of my mom’s family moved to the U.S. or Australia. These different places. But then for my dad, on his side of the family, his dad has remarried and stayed in Vietnam with his family. His half brothers and half sisters are still in Vietnam, so I think that’s why he still has that closer connection. Q: So you told me a little bit about your parents and their story. Do you feel like you fit into their stories, the narratives they tell you? If you went to Vietnam, do you see yourself being able to connect the pieces of your life with theirs? Q: That would be great! You could tell me more about that. Could you tell me what you hope to discover more about yourself in the future – in terms of your history or personal identity? Frances: I don’t know. That’s so hard. In high school, I thought I had everything figured out. I think everyone’s like that. But then I got into college and I was like, oh shoot I am learning so much about myself. I was learning way more than I did in high school. I was bummed out that I waited until my third year in college to finally get involved in these spaces and work with Asian Pacific Programs. In my third year, I was still getting the hang of what intersectionality means and all these words that we choose to throw around in those spaces. I feel there’s a certain way to carry yourself in those cultural, ethnic spaces. It wasn’t until this past year that I really understood why I’m using these terms to describe myself and my community. I was more confident with myself and who I was as a person, but there’s still so much to discover – not only about my culture and ethnic identity and how I connect with my parents and the homeland – internally and how I perceive myself as a person. My entire life, I have struggled with not liking who I am. It took me so long to actually like who I was as a person and I'm still trying to figure that out. In the future I hope I am more confident in myself, not only that I be able to talk about who I am as a person and my different identities, but I’d be able to talk to my brothers about it and have other people close to me open up to me about their identities. I feel like there’s so much! Q: It sounds like you really want to keep creating these spaces when you were in school with other people in your life. You told me about the programs you did in school and they’re really API-focused. Do you feel that you are more connected to concepts of racial identity than to ethnic identity? Frances: I think so, because of school. When I’m at school, we are connected to each other through this racial identity – identifying as Asian Pacific Islander. I think for me, identifying as API or Asian American felt very political. That’s how it all started. People would identify as Asian American for political reasons. Also I think it’s easier for me to identify with this racial identity than identifying with Chiuchow because growing up I didn’t really know any Chiuchow people. I didn’t really know what it meant to be Chiuchow. I didn’t know if Chiuchow was different from Chinese Vietnamese or Chinese. It’s really hard because I haven’t really found that community – that ethnic community. At my school, usually how people got connected to the Asian Pacific Student Programs is because they join all the cultural programs like Vietnamese Student Association or Chinese Student Association or Filipino Student Association and they get filtered into that cultural resource center. For me, I was the opposite. I got into the Asian Pacific Student Programs towards the end of my third year and branched out into my own cultural org[anization] and own ethnic identity. I checked out Chinese Student Association and it wasn’t for me. I don’t feel like I really fit in that group. Then I chose Vietnamese Student Association and I didn’t feel connected to that either. It’s just so much easier to connect with API. Q: Do you know of any other students or friends at your college who had a similar background to you? Frances: I remember my first year, there was actually a Chiuchow club. It was a different spelling – Teochew. It’s pretty much the same. It’s really confusing once you bring that up because Teochew is an umbrella term. In my head, Teochew would compare to Chinese. Within Chinese there’s Cantonese or Mandarin speakers. In Teochew, there’s more than Chiuchow. I remember going to the meeting and there was six people. I told myself I was going to stick this out because this was pretty cool and I found people who were Chiuchow, but the club wasn’t doing it for me. It wasn’t so much I didn’t find that community. I didn’t feel like it benefited me or that I learned much about myself. And then so when I joined Asian Pacific Student Programs, even though I met a more diverse API community I felt connected to these people more. Maybe for political reasons. Within that program, I actually met a couple people who identify as Chinese Vietnamese. That was cool. I was able to connect with them in that way. I know through the conversations we’ve had that they’re just as confused as I am with what it means to be Chinese Vietnamese. What I noticed is that most of the people I’ve met who are Chinese Vietnamese identify more as Chinese, which is interesting. I don’t why – maybe because on the daily, at home, they notice that it’s more Chinese than Vietnamese. Q: How strongly do you think outsiders affect your own perception of identity? Frances: If I stepped out of the 626, people would judge me based on my racial identity more than my ethnic identity. If I stayed in the 626 and I’m with my family, being Chinese Vietnamese and Chiuchow is really important to me. It really depends where I’m at. I know that my identity doesn’t change so much for myself wherever I go, but for other people and how they see me, that really depends on where I’m at. It depends on the communities and spaces I’m in and how they perceive me. Since coming out of college, I have a stronger sense of who I am and my identity. How people perceive my identity wouldn’t drastically change how I perceive myself. Q: How much effort would you say you put into being Chinese Vietnamese? Frances: I think my ethnic and racial identity influences everything, but not every little action I do. It’s not hovering over my head. It’s subconscious. When I talk to people and have conversations, I’m more conscious about the words I use more so because of my racial identity and not my ethnic identity. Coming out of UCR, I’m working a lot with APIs and that’s the community I’m identifying with. Everything I do, I’d be representing that community and not so much the Chiuchow community. It really depends on the spaces I’m in. Q: Right now, at this moment, what does it mean to you to be Chinese Vietnamese in America? Frances: I feel like that’s the first question I should have thought of before I came. [Laughs] I think it means a lot to be Chinese Vietnamese in America. Being Chinese Vietnamese, you don't really have one specific community that you can identify with. So you’re coming from these two different communities. I remember reading your blog for this project. We’re a “double minority” in that sense. It’s like saying I’m thinking about myself as a woman – that identity – and thinking of myself as a minority or person or color. Being Chinese Vietnamese, people will consider that as one ethnic identity. Frances Huynh is a graduate student in a dual program in Public Health and Asian American Studies at UCLA. She currently resides in El Monte, California. Frances Huynh in the courtyard of Arroyo HIgh School. To sum up what’s been happening in the past year since we’ve talked, I made it a goal to spend my time connecting back to my communities here in San Gabriel Valley and throughout Los Angeles, my relationships, and myself. From participating in a community health program that focused on the importance of patient-centered healthcare in East LA to taking care of kids and greeting customers at Ikea to working in social services for LA County for only a few weeks, I’ve learned to be more humble and the importance of always keeping community in mind in whatever I do.